The proposed coastal road along the western shore will have multiple interchanges / ramps to get on or get off the almost 30 km artery, to encourage motorists travelling shorter distances to use it and help decongest the city's internal roads. In the first phase of the coastal road from Marine Drive to Bandra, there will be four interchanges -at Amarsons garden in Breach Candy, Haji Ali, Worli and Bandra. These interchanges, with double decker ramps, will cover two of the coastal road's eight lanes (four in each direction). Officials said the interchanges have been planned after studying the locations and examining all details of the areas. A large part of the interchanges will be on reclaimed land and only the landing will be on existing roads, stressing that they will not block views from existing buildings and are, therefore, unlikely to meet with opposition from local residents. 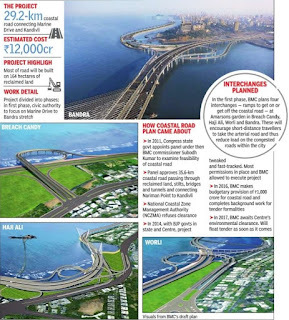 The BMC has prepared a draft plan for the interchanges which it will share with interested consultants. Once selected, the consultant will have the option to come up with its own design for the ramps, but the suggested landing directions are final. The BMC had made a budgetary provision of Rs.1,000 crore in 2016 in the hope that work can begin on the coastal road, but there has been no progress and the amount has remained unutilized. The BMC hopes to get the final Union environment ministry's all-clear soon. The road has been bumpy for the project since it is the first time in many years that the authorities are proposing to reclaim land from the sea to build infrastructure for the extremely congested western suburbs. As much as 164 hectares is planned to be reclaimed. Civic officials said they will reclaim land near the iconic Haji Ali Dargah and build an underpass (below the coastal road) to connect the main road to the shrine. The authorities are keen to boost south-north connectivity through the coastal road, on which work will progress in phases. Initially, the focus is on phase one from Marine Drive to Bandra. The BMC is in the last stages of finalizing the Request for Qualification process, where they have asked interested bidders to submit their work experience and other details. It is examining the interested bidders' background details and after finalizing RFQ, it will ask the selected bidders for their designs for the coastal road and about the technology they plan to use.